Plotting the Lennard-Jones potential across a very large distance will give something similar to that shown below. 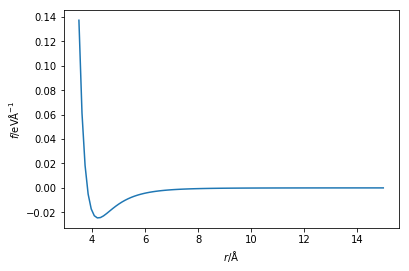 When there are periodic boundaries present (mentioned later), the cut-off ensures that the forces are not sampled incorrectly by having a cut-off of less than half of the cell size. This Python code below shows a modification of the Lennard-Jones potential that accounts for this cut-off. is considerate of the cut-off.